The beginning of school is sneaking right up on us. Law school will be here before we know it! For the incoming 1L's, that means orientation time. Law school orientation is the first step in the law school journey and I know around this time last year, I was very nervous for it. It is hard to know what to expect- undergrad orientation is usually an experience for making friends and getting to know your new city. Law school orientation is more a time for letting you know how hard your next three years will be and telling you how to survive. 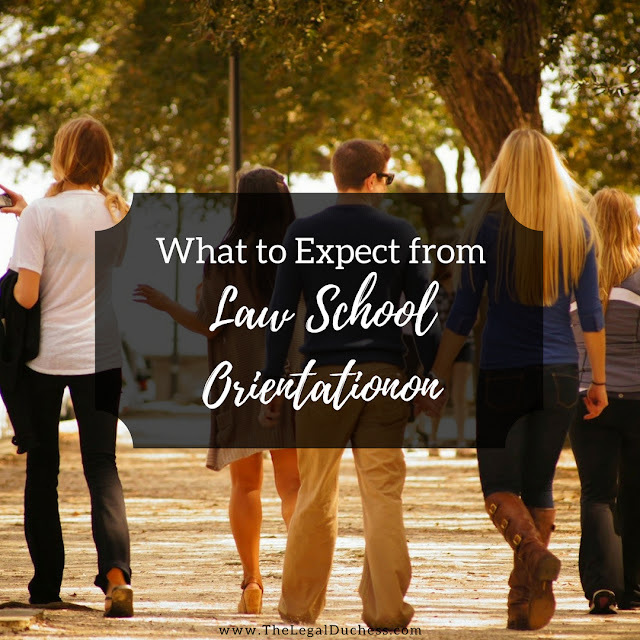 Law school orientation is an important part of the experience as a 1L but try not to be too nervous- it's only step one. Orientation, in a nutshell, is a time for introducing you to your new law school, touring and preparing for the first classes. They vary in length, mine was 1.5 days and others have a full week. Expect a lot of speakers, icebreakers, food, networking, mixers, handshakes, free handouts, scary talks and mock classes. You will tour the school, hear about the school programs, clubs, and organizations, hopefully, get your free Lexis Nexis Camelbak, lots of other free books and outlines, free food and more advice than you will know what to do with. It will be your first chance to meet your classmates so make a constant effort at putting out the impression you want- this is the beginning of your legal image so make of it what you wish. You do not want to be known as the person who got blackout drunk at the first law school mixer! Every orientation is different but here is some blanket advice that should apply anywhere to help you prepare! Orientation is the best place to make some new law school friends. Everyone will be nervous and stressed out so seeking companionship and people who feel the same way is a good way to go into your first day feeling less alone. I made my closest law school friends during orientation. My first year of law school would have been so much harder without my friends- they were the best support system who truly understood what I was going through. Be open to friendships during orientation and have a few conversation topics ready to go. Everyone will be nervous and seeking new friends so be open to that and make some new law school friends- I promise it will make your first-year easier! Law school is very intimidating. It is scary to start this new venture and orientation is the beginning of the process. I know my stress and fears were at an all-time high around orientation. During orientation, they tend to prepare you for the worst... warning about the alcohol abuse in law school and the legal profession, suicide rates, drop out rates, etc. Take everything with a grain of salt. Likely you will not encounter most of the issues they mention. Also, don't always listen to 2Ls and 3Ls- the teacher they all warned us would be awful turned out being one of my favorite and I got a great grade in his class. Like I said, take everything with a grain of salt and don't let them scare you before you even start. While you should be slightly cautious of what everyone is telling you, make sure to take it all in. Don't tune it out. There is some very helpful information provided in orientation about your school, what the next 3 years entail and how to be a successful law student. Listen closely to advise from upperclassmen, try to find a mentor within the school and make sure you are open ears to any law school knowledge being passed around. Interact with professors, try to meet new friends, join in on any and all activities- make the most of orientation. It is designed to prepare you for law school so make sure you are making the most of it and taking in everything the program has to offer. Orientation may be the beginning of law school but classes have not started yet. Try to relax and enjoy your last bit of freedom while you can. Watch Netflix, go out to dinner, do a face mask and make the most of free evenings- they will be few and far between once classes start. Relaxing during orientation is good but don't go overboard- make sure to complete your first class reading assignments, pack your supplies, have your computer ready to go, buy all your books and scope out parking locations. It is never bad to be prepared a little early and be able to enjoy those last few days when the orientation stuff is over for the day. You want to be prepared and ready to go when that first law school class rolls around and be able to enter it with confidence.